Few cinematic visionaries have an eye and an ear quite like Quentin Tarantino. The man is a brand of his own. When you sit down for one of his movies, you know that the experience of it will be quite different from any other piece of filmmaking not of his craft. Tarantino is a storyteller through and through, possibly a little self-indulgent in his work and overly animated in his regard for gratuitous violence, but he has a talent for originality from concept to execution. 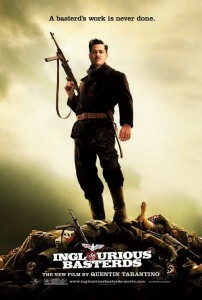 “Inglourious Basterds” surpasses all of his recent works. I won’t pretend to know anything about the previous incarnation of “Inglorious Bastards,” but I will say I doubt there can be much comparison based on Tarantino’s signature style and knack for meaty ongoing dialogue. 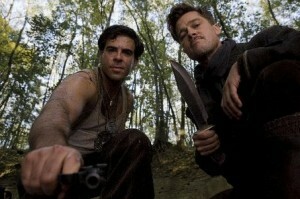 Much of “Basterds” is just that: a lot of style and talky-talky. But, like all Tarantino works, the dialogue is so interesting, well-thought-out, and well-delivered that it really absorbs the audience. Many scenes in the film are built around conversation and the tension often skyrockets. The actual plot (or plots) of the film seem to exist as an afterthought when the written page onscreen has us so wrapped up. I will admit I underestimated the storyline for this film. I assumed (based on the marketing) that Brad Pitt’s character, Lt. Aldo Raine, and his group of soldiers would spend 2 1/2 hours trekking through WWII Germany hunting, mutilating, torturing, and beating Nazis to bloody pulps. Well there is some of that, yes, and some of it is very gratuitous and very violent. Ultimately, that’s not the meat of the story. Like all Tarantino movies, he constructs these sub-plots that intersect into one final meeting for the characters. And that is the case here as well. The movie opens with with a group of Nazi soldiers searching for Jews in hiding. 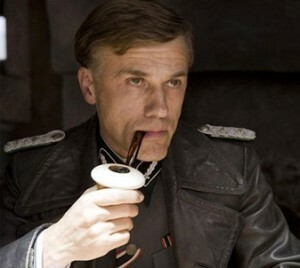 The Nazi leader, Col. Hans Landa (Christoph Waltz), drills a dairy farmer for suspected harboring of a missing Jewish family, which the farmer has secretly been doing. Upon the family’s discovery, Col. Landa orders them to be executed. One of the younger girls of the family manages to escape and carries the horror of that day with her, until four years later she has an opportunity to avenge her family, which plays into the other developments of the story. This particular scene reaches an unbelievable amount of tension and is, truthfully, beyond spectacular. Heartbreaking, yes, but unbelievably effective. Besides Tarantino’s expert penmanship, due credit belongs to Christoph Waltz’s slithering, brilliant performance–one that will guarantee him an Oscar nomination come year’s end. Every time he’s onscreen, there is an unsettling sensation running through your veins, and he has many scenes to steal the show. The Basterds’ chapter comes in after that setup. As promised by all the commercials and trailers, Brad Pitt’s (who is hugely funny here) slurring southern Leuitenant calls upon him eight soldiers–experts in Nazi killin’. Among the most recognizable faces are B.J. Novak from ‘The Office’, and Eli Roth (director of Cabin Fever and Hostel). Roth is the only ‘actor’ in the film that doesn’t quite fit the bill. It feels very much like an extended cameo by a filmmaker, and it never quite works for the overall look and feel of the movie. It’s not that he hinders the movie per se, but his presence and performance fail to mesh with everything else. And that’s hard to do in a film where Tarantino lets anything fly as he totally rewrites history in scene after scene, amounting to sheer brilliance for the most part. “Inglourious Basterds” is not just violent, or bloody, but it’s also quite humorous, as Tarantino turns Hitler into a cry-baby cartoon, and then saddles every character with outrageous, gut-busting dialogue. Listen to Brad Pitt pronounce “Bonjour-no” trying to masquerade through a Nazi gathering as an Italian. Many viewers will walk away offended by the treatment of WWII and the Holocaust as presented here, but this movie is all about fantasy. This is an alternate-reality revenge-flick put upon the Nazi regime. Think a successful version of “Valkyrie” meets “Pulp Fiction” meets “Man on Fire.” The tone of “Basterds” almost works perfectly, but Tarantino does let his scenes run on for some extended length, which make for a very long movie. Almost every frame actually does work, but as usual for its writer-director, this movie takes its sweet old time. I can’t complain too much. This is the work of a filmmaking pioneer, like it or not. Quentin Tarantino’s short resume has revolutionized cinema to some extent. “Inglourious Basterds” is a welcome return to greatness we haven’t seen since 1994’s Pulp Fiction, and one of the few great films we’ve been granted this summer. 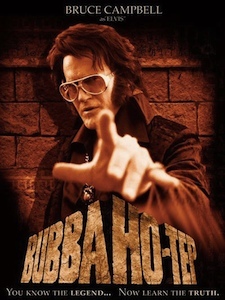 As a whole, this movie is a bit hit-and-miss, but mostly an awesome, violent, bloody, hilarious, history-rewriting event that should not be missed.